I found bucatini on sale at Medi-Ya, Liang Court. 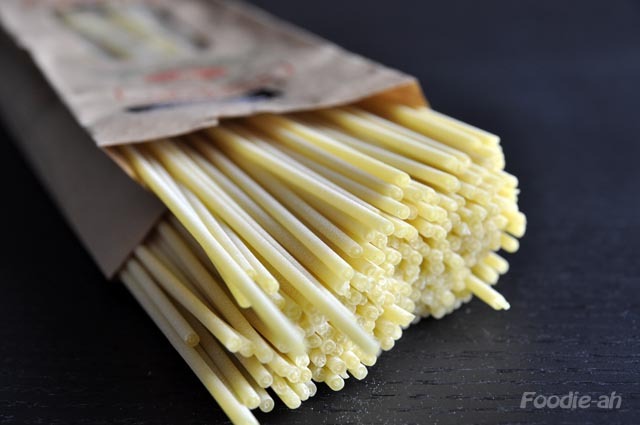 The package was so attractive I couldn't resist from buying this delicacy pasta, which I haven't eaten for years! The other thing I bought was a burrata at the "Quattro Stagioni" Italian deli in front of Medi-ya. What a perfect combination! 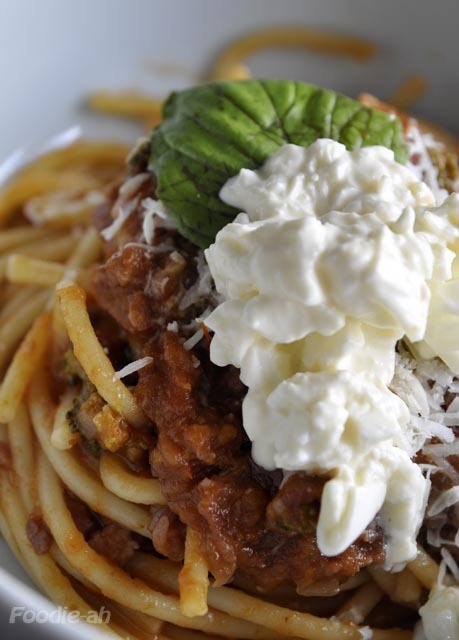 Usually bucatini are served "all'amatriciana", which is a roman tomato based sauce with guanciale or pancetta tesa. Definition of Bucatini from Wikipedia: "Bucatini is a thick spaghetti-like pasta with a hole running through the center. The name comes from buco, meaning 'hole' in Italian, while bucato means 'pierced'. Bucatini is common throughout Lazio, particularly Rome". 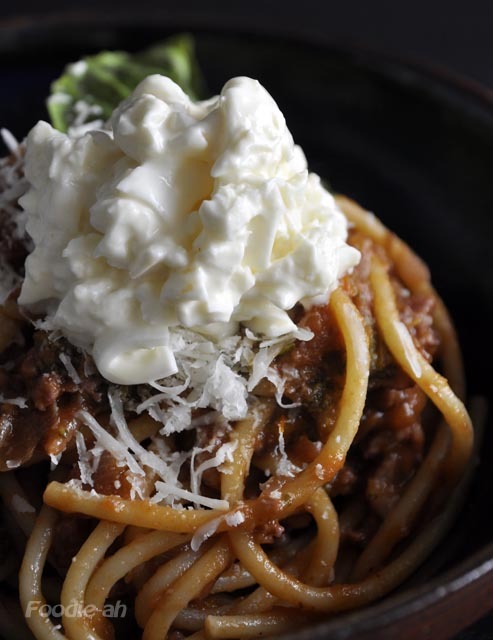 This dish is all about the combination of the rustic ingredients and rich tomato sauce with this rough cut of pasta and the fresh burrata to finish. The recipe is quite simple. Cut the tomatoes in half, remove the seeds and put them together with the peeled shallots on a baking tray and bake them for 40-60 mins at 180C until they are well reduced, as described in my gnocchi recipe. Pass them into a blender and chop into a chunky sauce. Put some oil on a frying pan and fry the bacon, add the minced pork and when all the juices have dried out pour the red wine and let evaporate quickly. Add the stock and reduce to taste (depending on the intensity of the stock), together with the broccoli shredded into small pieces. Finally, add the tomato sauce and basil, salt as necessary and cook for a further 5 minutes or so. Remove from the fire and let it rest while cooking the bucatini. Once the bucatini are ready, stir well into the sauce and serve on a plate. Top with a bit of the sauce, grated Parmesan, a leaf of basil and finally a serving of fresh, chopped burrata. I hope you'll enjoy it as much as I did. Stumbled across your blog, and you're on my list of bookmarks. This recipe sounds delish. I must try. Keep eating and blogging! Thanks, Sharon. They are still selling the bucatini at Mediya, and the burrata at Quattro Stagioni (in front). Good luck! Hi, would you know where the italian grocer is located now after they closed their store at orchard central? Sorry, I really have no idea, but let us know if you manage to find out!